After the devastating loss of Tank (BISS CH. Blue Knight INXS) this week, I have found a need to write. We’ve lost many dogs since 1980, and each of them has brought heartache, but this one seems to have hit harder. We’re getting older. Our breeding/showing days are numbered. Time is not on our side. His loss is a major dose of reality – an era has come to an end. Handling rambunctious big boys is harder now with many orthopedic surgeries behind me. The loss of this one has brought a nostalgic flood of memories and emotion that I want to write down. It’ll take time to tell all the stories, and document the memories of nearly a lifetime in dogs, but it is winter in North Idaho, I have nothing but time, and nothing but affection for these wonderful, silly dogs. Tomorrow is New Year’s Eve. What better time to start something, than the beginning of a new year? 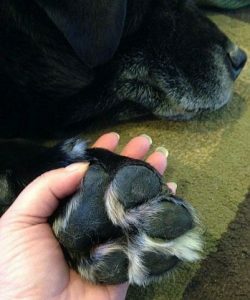 These paws racked up a lot of miles, and it is unlikely that any dog will ever fill his paw prints (literally, he had the largest paws of any Lab I have ever owned). Never was a dog so gentle and tender in nature. He would walk among the tiniest puppies with great care. I will miss holding his paws in my hand.